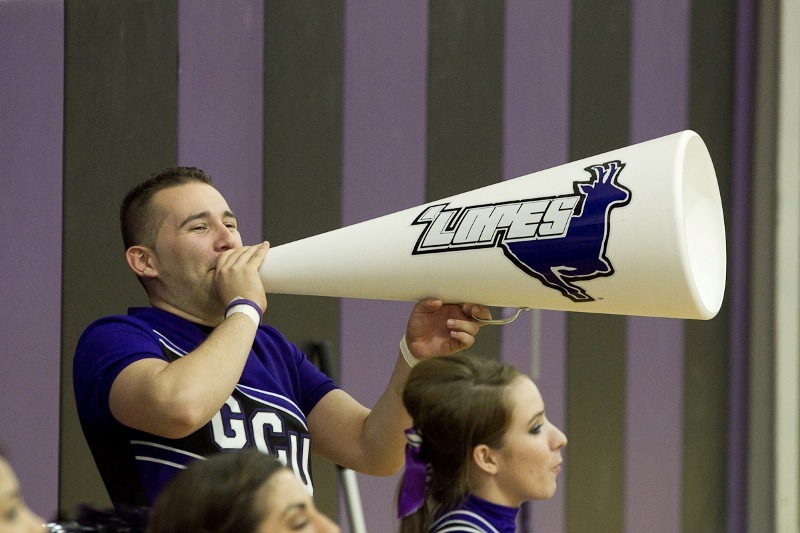 GCU Men’s and Women’s basketball hosted Hawai’i Pacific University last night. Festivities included honors for GCU men’s soccer as well as the senior GCU Cheer and Dance team members. The Boys & Girls Club dance team – d.a.i.n.o.w. – performed during halftime of the men’s game. Our women’s team overcame a brief second-half lead by Pacific West Conference leader Hawai’i Pacific University en route to a 70-60 victory. All-America candidate Samantha Murphy scored 20 points, including 12 of 12 at the free-throw line. With several games still to play, she now has the school single-season scoring record (580 points and counting). GCU (21-2) and Dixie State College are tied for the PacWest lead at 9-1, with HPU third at 10-2. The Antelopes’ stout defense held Hawai’i Pacific to 17 percent shooting in the first half in a 74-57 victory Thursday night. GCU (13-7) has won 11 of its last 13 games and is in the thick of the PacWest race, tied with Dixie State at 8-2. Brigham Young University-Hawai’i and Chaminade University lead by one-half game at 9-2. After Saturday’s and Monday’s home games, the men’s and women’s teams conclude the regular season with four league games apiece in Hawai’i, starting on Saturday, Feb. 26.